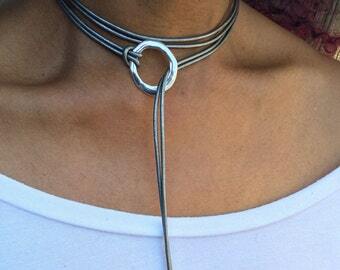 Announcement Leather Wrap Bracelets & Choker Wrap Necklaces - Available for wholesale and retail. "LIKE" our Facebook page facebook.com/shopwrapsbyrenzel. Visit Instagram @wrapsbyrenzel & Twitter @wbrenzel for special discounts and promotions!!! 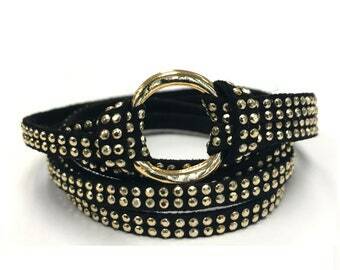 Leather Wrap Bracelets & Choker Wrap Necklaces - Available for wholesale and retail. Shipped fast, quick reply from seller, love this bracelet! I ordered three different colors. Love them! 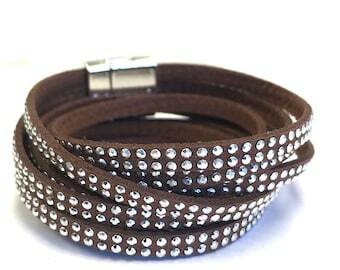 Handcrafted Leather Wrap Bracelets, Chokers & Accessories! My name is Gayle Corn. Welcome to my shop! I design and create stylish bracelets, accessories and chokers out of leather to suit your taste and style. I’m originally from Boston and earned my B.A. in Communication Studies from Emerson College. In 1987, I moved to Los Angeles to pursue a career in the music industry. But the opportunities dried up and I put my focus on marketing and advertising in other industries. One thing that truly kept me going when times were uncertain was my love for handcrafting jewelry, and this turned into a full-time passion. That’s when my Etsy Page “Wraps by Renzel” was born. I’ve been asked how I came up with the name Wraps by Renzel. I created it from my parents’ names, Lorenzo and Helen. Sadly, they are no longer with me. But thanks to “Wraps by Renzel”, they are with me in spirit every day. I take my inspiration from the world around me and combine vibrant colors and contemporary ideas to create unique, wearable conversation pieces. Each piece is made by hand with home-grown leather from the United States and made with attention to detail and love. Knowing that many people have busy lives and different tastes, I’ve done my best to create a variety of looks and styles that will appeal to everyone. From modern to bohemian styles, from simple to classic looks, my collection has a look for you. All of my products are made right in my Los Angeles studio. No matter what your personal style is, I am certain that I can provide you with a look that you will love. Every item ships in a lovely kraft gift box. Have questions or want to know more about my work? Need a suggestion for yourself or for a gift? Contact me! I’d love to hear from you and see what I can do to help you find the perfect piece! Wraps by Renzel’s handcrafted products combine leather, tube beads, and magnet ready design with contemporary ideas to create a unique conversation piece. This chic and affordable collection is handcrafted in the USA. Welcome to Wraps by Renzel handcrafted leather wrist wear and accessories.